Fender has revealed its recreation of Jimmy Page’s iconic “Dragon” hand-painted 1959 Telecaster guitar. The Custom Shop Dragon Telecasters feature hand-painted flourishes by Page as well as a signed headstock and a signed certificate of authenticity. The guitars will be available to purchase in March. The guitars will be sold through selected Fender dealers around the world. Cheaper models of the Dragon and mirror guitars will be released later on in 2019. Fender said on Wednesday that it will release a $1,399.99 production version of the Dragon Telecaster in Summer, and a $2,499.99 production version of the mirror guitar in the Spring. The production models won’t include any signatures from Page, Fender said. 7.25”-radius rosewood fingerboard matching the specs of the era, right down to the 21 vintage-sized frets. Page was originally given the guitar by Jeff Beck in 1966. In February 1967, Page decorated the guitar with eight circular mirrors. Page played the mirror guitar during his time in The Yardbirds, and then repainted it himself with a dragon design and used it during the early years of Led Zeppelin. A friend of Page’s stripped the guitar back in 1969, removing the dragon paint job and ruining much of the Telecaster. “It was a disaster,” Page told the Associated Press in an interview. Page kept the guitar, though, and has worked with a graphic designer to restore it and repaint it. He approached Fender about releasing models of the guitar for people to buy. “Jimmy actually invited us to his house in London to spec the guitar out,” said Fender Custom Shop Master Builder Paul Waller. The reveal of Fender’s Dragon Telecaster recreation comes one day after Page announced the release of a new amplifier which mimics his set-up during his time in Led Zeppelin. 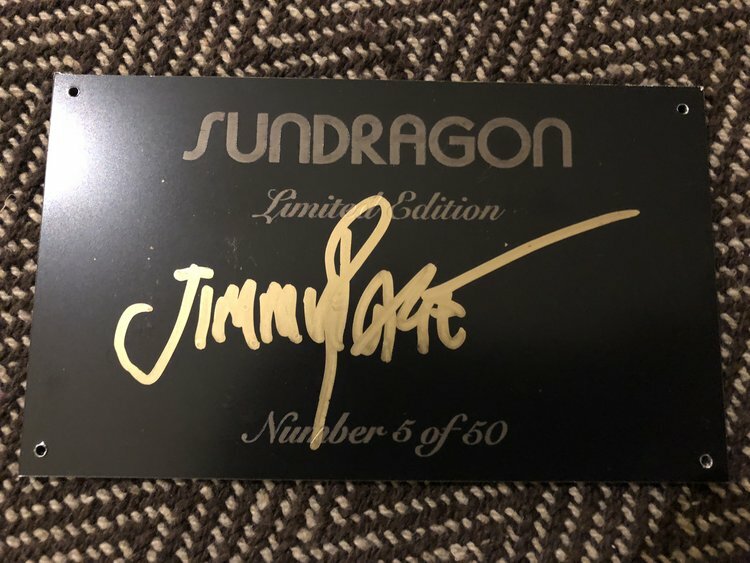 The website for the Sundragon amp says that 50 limited edition, hand-built amps will be released in 2019. All of the limited edition amps will be signed by Page. A standard model of the amp will be released later in 2019, the site said. The amps are being made in conjunction with music producer Perry Margouleff and guitar amp expert Mitch Colby. The guitar shown in these photos with the Sundragon amp isn’t one of Fender’s recreations – it’s the first look at Page’s restored original Dragon Telecaster, Fender confirmed to LedZepNews. “I had been impressed with the forensic analysis both Mitch and Perry had put into the research of the sonic reproduction of the original Supro amp to arrive at the Sundragon,” Page said in a statement on the Sundragon website. 5 Comments on "Here are all the details of Fender’s recreation of Jimmy Page’s Dragon Telecaster"
Why so expensive on the signature starts? Great guitar I’m sure. If you’re a collector with tons of dough, I’m certain it will prove to be a great investment.